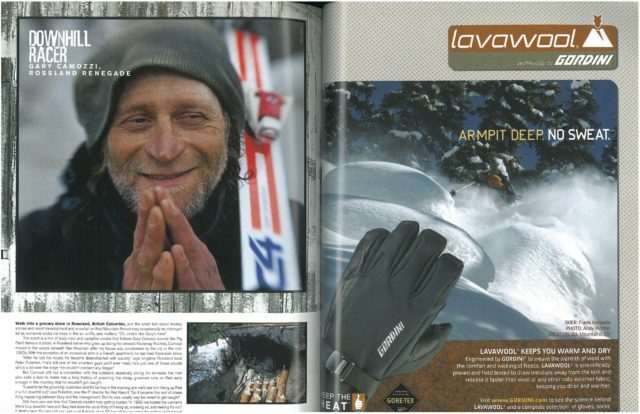 This article originally published in the January 2006 (35.5) issue of POWDER. Inside Todd Stuart's backcountry hut, a spiral-bound journal dangles from a dirty green tarp serving as the roof. Its first line reads: "Welcome Friends!" Two simple words; just a salutation really, but you'd be hard-pressed to come up with a more fitting symbol for a man who calls the Wasatch backcountry his home. A native Utahn, the 47-year-old Stuart has spent the last 15 seasons living in a hut deep in the Wasatch. On the surface, his idea for the shelter was financially motivated–it allowed him to meet obligations for child support and taxes while earning a ski patroller's wage. But it's clear his reasons run deeper than that. This is his home, his life—his spare time filled with music, reading, writing, and waxing skis. He's no hermit. Trips to Park City–via skins–are a regular occurrence, and he has a girlfriend who visits often. And, of course, there's that little thing about skiing every day. The hut backs up to a cliff face, sheer rock forming the rear wall. Inside, logs form a sturdy frame, while rough shelving and ammo boxes house the necessities: everything from dry goods to an out-of-tune guitar. Firewood is harvested from the abundant avalanche debris. There's a spring 50 yards from his doorstep, and dry goods are the staple gro- cery run—they're light to carry and easily pre- pared. Despite the basic amenities, tarps and snow are all that separate him from the ele- ments; he's recorded temps at 30-below on more than one occasion. Then there's the skiing. Stepping from the hut, Stuart points out his favorite stashes. Below stretches a steep, boulder-strewn slope. He boasts of dropping friends among the trees, his well-trained feet light with skinny tele skis. Above, Raspberry Bowl: so named for its wild summer crop. "Nothing goes better with raspberries than cream," he shouts, laughing with the memory of pow days past. Beyond, north-facing chutes litter a mile-long ridgeline—more skiing than you could explore in a season. You'd expect Stuart to be protective of such bounty, but he's far from it. He's written and self-published a book about his mountain lifestyle, and even had a segment in a small ski flick from the Utah-based PowderWhores (a label he, too, proudly wears) to pass along his message. "We need to learn to share, and that's what I'm all about," he says. "If you've got the guts and the energy, come on up. And when there are lifts up here, I hope to be selling 10-dollar beers out of my house!" But Stuart's hut may not last long enough for politicians to grease the long-sought-after resort interconnect in the Wasatch. This summer, he received a 30-day evacuation notice. The only thing keeping the hut standing is a ranger's compassion, and an uncertainty as to which side of a property line the hut occupies. Stuart still plans to return for his 16th winter of backcountry bliss. In the shelter of the storm, his home remains open to anyone who may come his way. "Peace, Love, Hope. —Todd." Walk into a grocery store in Rossland, British Columbia, and the small talk about hockey scores and resort development and snowfall on Red Mountain Resort may occasionally be interrupted as someone sticks his nose in the air, sniffs, and mutters, "Oh, smells like Gary's here." The scent is a mix of body odor and campfire smoke that follows Gary Camozzi around like Pig Pen's famous dustball. A Rossland native who grew up skiing his beloved Kootenay Rockies, Camozzi moved to the woods beneath Red Mountain after his house was condemned by the city in the mid-1980s. With the exception of an occasional stint in a friend's apartment, he has lived there ever since. "After he lost his house, he became disenchanted with society," says longtime Rossland local Peter Fullerton. "He's still one of the smartest guys you'll ever meet, he's just one of those people who's a bit over the edge—he couldn't connect any longer." But Camozzi still has a connection with the outdoors, especially skiing. An ex-racer, the man who calls a lean-to home has a long history of poaching the steep, groomed runs on Red early enough in the morning that he wouldn't get caught. "I used to be the grooming supervisor and it'd be four in the morning and we'd see him hiking up Red in a full downhill suit," says Fullerton, now the IT director for Red Resort. "So it became this sort of chase thing happening between Gary and the management. But he was usually way too smart to get caught." Still, there was one time that Camozzi couldn't help getting busted. "In 1990, we hosted the women's World Cup downhill here and Gary had done his usual thing of hiking up, sneaking on, and making his run," Fullerton says. "But about 8 a.m. I get a call that he's stuck 30 feet off the ground in the netting. He'd missed a corner and got tangled up in the safety nets. We finally get him down and he puts his skis on and takes off again. So I yell at him asking what the hell he was doing and he says, 'Finishing my run.'" "Crazy Craig" Barnard keeps a toothbrush in his day-pack. Although concerned about hygiene, he only takes it so far. His once-gray Patagonia ski pants, for instance, are now the earthly shade of countless mountain adventures. Having climbed and skied wild Alaskan peaks for over a decade, he's developed an ingenious technique—"The Flex Capacitor"—for carrying skis in the bush. Craig makes his home, year-round, in an 8-by-10-foot guide-tent on Alaska's Kenai Peninsula, powering his lamp, clock radio, and smoker with a neighbor's extension cord. "My mom's a gym teacher, my dad's a biologist. Put the two together and you get an Alaskan ski bum," says Vermont-raised, 33-year-old Craig. "I'm taking the back-door approach to skiing in Alaska. For me, it's all about being local, exploring this endless mountain wilderness one tour at a time." 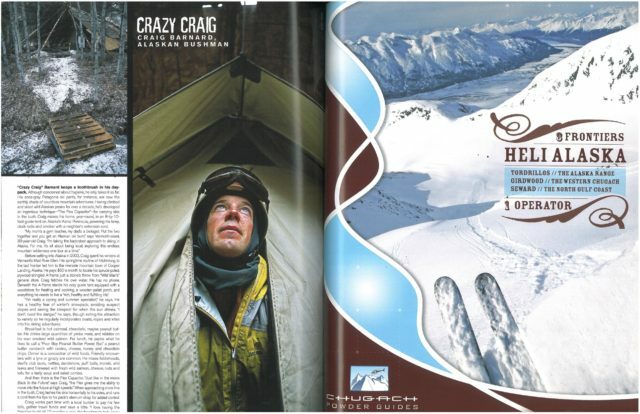 Before settling into Alaska in 2003, Craig spent his winters at Vermont's Mad River Glen. His springtime routine of hitchhiking to the last frontier led him to the riverside mountain town of Cooper Landing, Alaska. He pays $50 a month to locate his spruce-poled, plywood-shingled A-frame just a stone's throw from "Wild Man's" general store. Craig fetches his own water. He has no phone. Beneath the A-frame stands his cozy guide tent equipped with a woodstove for heating and cooking, a wooden-pallet porch, and everything he needs to live a "rich, healthy and fulfilling life." "I'm really a spring and summer specialist," he says. He has a healthy fear of winter's snowpack, avoiding suspect slopes and saving the steepest for when the sun shines. "I don't need the danger," he says, though noting his attraction to variety as he regularly incorporates boats, ropes, and kites into his skiing adventures. Breakfast is hot oatmeal, chocolate, maybe peanut butter. He drinks large quantities of yerba mate, and nibbles on his own smoked wild salmon. For lunch, he packs what he likes to call a "Poor Boy Peanut Butter Power Bar," a peanut butter sandwich with raisins, cheese, honey and chocolate chips. Dinner is a concoction of wild foods. Friendly encounters with a lynx or grizzly are common. He mixes fiddleheads, devil's club buds, nettles, dandelions, puff balls, morels, wild leeks and fireweed with fresh wild salmon, cheese, nuts and tofu for a tasty soup and salad combo. And then there is the Flex Capacitor. "Just like in the movie Back to the Future," says Craig, "the Flex gives me the ability to move into the future at high speeds." When approaching snow line in the bush, Craig lashes his skis horizontally to his sides, and runs a cord from his tips to his pack's sternum strap for added control. Craig works part time with a local builder to pay his few bills, gather travel funds and save a little. "I love having the freedom to ski all 12 months a year, the freedom to truly enjoy nature," he says. "At first, I found myself taking a vow of poverty, but then I'm rewarded by so many rich and incredible experiences." Tucked up into the canopy just east of Stevens Pass Ski Area lives a growing example of dirtbag ingenuity and extreme arborism. Seventy-five feet back from the bank of Highway 2 and suspended 50 feet up in the pines is the domicile of Tony Detmer. Known as "Tree House Tony," Detmer built his dwelling seven years ago to escape substandard ski-area employee housing. Slowly he added a second and then a third story, installed a composting toilet, swapped the woodstove for propane heat, and perfected the fulcrum on a precarious 50-foot rope swing that launches from the deck. Crammed inside the plywood walls are a two-burner cookstove, hanging couch, second-story smoking lounge, and lofted turret-style bedroom, which is reached via a step-by-step ascent of the interior furniture. All is linked to eight fir trees (ranging in height from 120-150 feet) by 'biner and girth-hitched webbing, which needs regular tightening to combat sag. Tony salvaged most of the construction materials from a demolished Department of Transportation sand shed. His total six-year cash outlay–including all added amenities–is less than $3,000. Last February, Tony kicked down and turned from squatter to landowner with the joint purchase of the surrounding three-and-a-half acres. His dream of creating an Ewok Village is moving forward, with three new arrivals constructing their own tree houses and his neighbor returning to the teepee next door. Even considering the huge financial benefit, Tony, who works as Tube City manager at Stevens Pass, says living this Spartan lifestyle can prove taxing. His biggest headache is the constant shoveling of the massive Cascadian snowfall. After a big dump, a minimum of three hours is required to shovel the path, the deck and all the fort's flat surfaces. "I shoveled way too much last winter," he says emphatically. "I'm putting on a new roof so I can spend less time shoveling and more time making turns." Wildlife encounters are another hassle. Bear and marten visit at regular intervals, but Tony says keeping the resident rodent population at bay is his biggest day-to-day struggle. Tony also mourns two casualties brought about by the cougar: a pet cat that became a midnight snack and a skittish girlfriend. His current routine is marked by an excess of solitary confinement, which is warded off by a steady supply of paperbacks–including the entire Star Wars lineage–stacked on his shelves. Other treetop challenges include withstanding strong alpine winds slowly shaking the structure loose, chainsaw pruning duty on the slick roof, and high propane consumption–which requires a two-tank-per-week haul for regular heating and cooking. Then there is the composting toilet, which functions poorly in cold weather and forces business to be done on the clock at the ski area. Yet even faced with the associated hardship, Tony says he is unlikely to trade his perch for life on the ground. He sees his solution as the best method of maximizing vertical, connecting with nature, and living with less. We saw it while we were navigating a back alley in Jackson looking for little ski shacks to photograph. It was covered in snow, but we could tell it was a bus—the kind you see in old Motown videos or a Rosa Parks documentary. It had the graceful lines, chrome highlights, and air-streaming of a classic car. We pulled over to take a picture. It was only then that I spotted two propane tanks near the rear exit and said to Dave, "I think someone's living in there." Indeed there was. A feral. Though a little rough around the edges, Chip Hildebrand exhibits all the classic characteristics of the mountain feral: smart, scrappy, low overhead. He grew up in Jackson and has been living in his 25-foot '57 Chevy bus off and on for 15 years. "The Bus" is tough as hell and still runs with a 498 Cadillac under the hood, steel frame and siding, and a decade and a half of improvements. The parking spot the 34-year-old uses: a patch of dirt in front of his best friend's mom's house. Hildebrand exists both close to and far from the earth, making a living as a paraglide instructor. He's skied in B.C. and Utah but sticks mostly to Jackson. When Jackson Hole Mountain Resort started charging for parking, jacked ticket prices and "put boxed pine trees in the parking lot," Hildebrand hit the road for humbler hills. He now skis at Grand Targhee and on Teton Pass. As for his condo-on-wheels, Hildebrand has tricked The Bus out with a 50-gallon water tank for hot and cold water, a four-burner propane stove, and furnace. When Dave and I squeezed through the back door to check out his digs, he treated us to a showing of the art film Baraka while he surfed the Web on a free wireless network. Though The Bus has never left the valley, Hildebrand says every now and then it makes the journey to the Teton Village parking lot. Corporate or not, he says, that's its natural habitat. 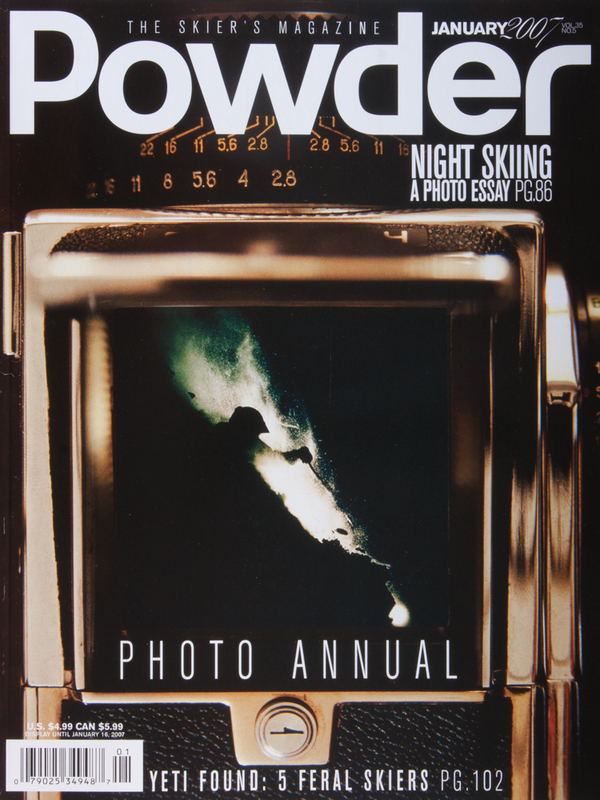 "I'm a real popular guy on powder nights," he says.